SlimPAR HEX 6 IRC is a low-profile LED PAR with 6-in-1 LED technology (RGBAW+UV) and built-in infrared remote control capability. The sit-flat housing hugs the floor and features power and DMX outlets on the side, while 6-in-1 LED technology generates a broad spectrum of colors and achieves natural-looking color temperatures. For wireless operation and control, use the optional IRC-6 remote for point-and-shoot operation of static colors and automated programs. Considering purchasing the Chauvet SlimPAR HEX 6 IRC? Have questions? Ask people who've recently bought one. Do you own the Chauvet SlimPAR HEX 6 IRC? Why not write a review based on your experience with it. This is a great light for almost anything. This light works as a great up light, and also a stage wash. It is extremely bright and puts plenty of light on whoever is on stage!! Perfect!! 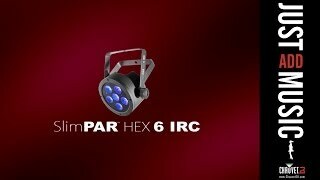 Seen a video for Chauvet SlimPAR HEX 6 IRC online or have you own video? 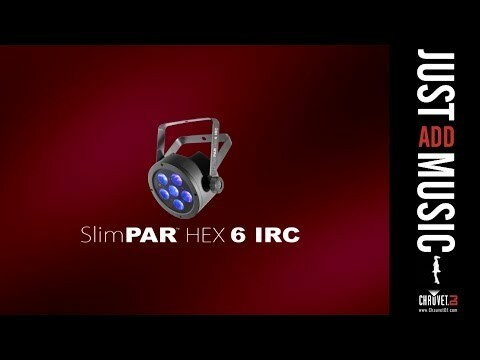 Check out Chauvet SlimPAR HEX 6 IRC on DJkit.com!